For a contribution of $35, which supports the Garden, you will receive an emblem use authorization statement and instructions on how to obtain your plate. For a contribution of $70, you will receive authorization for a two-year plate. Missouri statute 301.3043.1 requires all individuals applying for the Garden plate must be current Garden members. 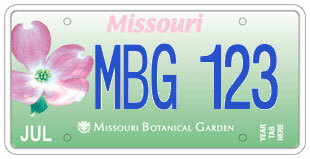 The Missouri Botanical Garden’s license plates feature a pink flowering dogwood, a lovely example of the state tree and of the Garden’s collection of these native beauties. Funds from one-year or two-year Garden license plates support annual operations at the Garden, including world-class horticultural displays and care for dogwoods across our historic campus and at Shaw Nature Reserve in Gray Summit. Each April and May, both locations boast hundreds of dogwoods in bloom, representing dozens of unique species and cultivars. If you have questions or would like to order by phone, please call (314) 577-5118 or email membership@mobot.org.